The role of women leaders in veterinary medicine is the focus of a new book from the Purdue University Press. 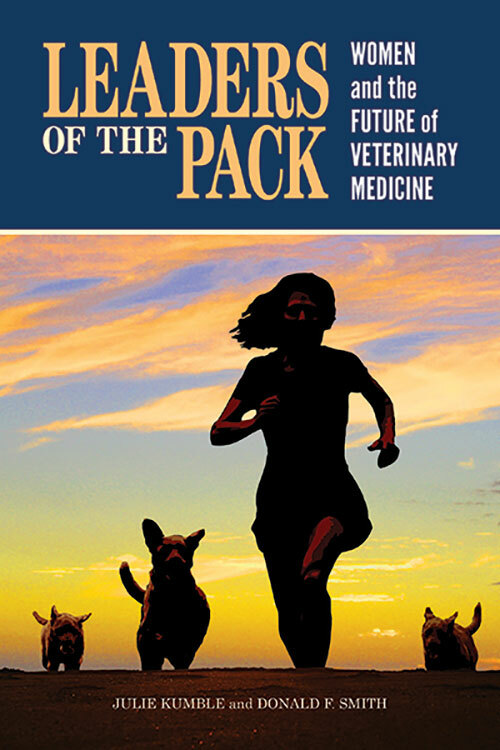 "Leaders of the Pack: Women and the Future of Veterinary Medicine" explores key themes in leadership and highlights women in veterinary medicine whose stories embody those themes. The book was co-authored by the late Dr. Donald Smith, former dean of the Cornell University College of Veterinary Medicine, and Julie Kumble, a researcher, writer, and founding director of the Leadership Institute for Political and Public Impact at the Women's Fund of Western Massachusetts. In the book, the authors utilized more than three years of interviews to profile a wide variety of women as they share triumphs, challenges, lucky and tough breaks and the sound advice and words that inspired them to take their careers in unanticipated directions. "We are excited that the Purdue University Press is sharing these stories of women in veterinary medicine and hope that this inspires a whole new generation of women veterinarians to pursue leadership positions in the veterinary profession," said Purdue Veterinary Medicine Dean Willie Reed. Women now account for 55 percent of the active veterinarians in the field, and nearly 80 percent of veterinary students are women. However, average salaries for women in the industry have dropped as this shift has occurred, and even with women in the vast majority, only 25 percent of leadership roles are held by women. The book is part of an ongoing series from the Purdue University Press. "This is an important work and a valuable addition to our New Directions in the Human–Animal Bond series," said Peter Froehlich, director of the Purdue University Press. "We are proud to be its publisher." Click here for more information about the book from the Purdue University Press. Co-author Donald Smith was an accomplished large animal surgeon and avid veterinary historian. On the occasion of the fiftieth anniversary of the Association of American Veterinary Medical Colleges (AAVMC), he completed a commissioned work on the history of veterinary medical colleges entitled, "Pathways to Progress." The book, which includes a chapter about Purdue Veterinary Medicine, was released in 2016. A diplomate of the American College of Veterinary Surgeons and the ninth dean to lead the Cornell University College of Veterinary Medicine, Dr. Smith passed away last October.